I don’t think that’s a swarm. But it could be that the bees are hanging out on the outside of the hive because there is no room for them on the inside without overheating the place. Chances are, you have swarm cells in the hive, but they are not advanced enough or the queen isn’t ready enough to actually swarm. A swarm looks like a upside-down cyclone of bees spewing from the hive and swirling around in the air, and it’s very loud. 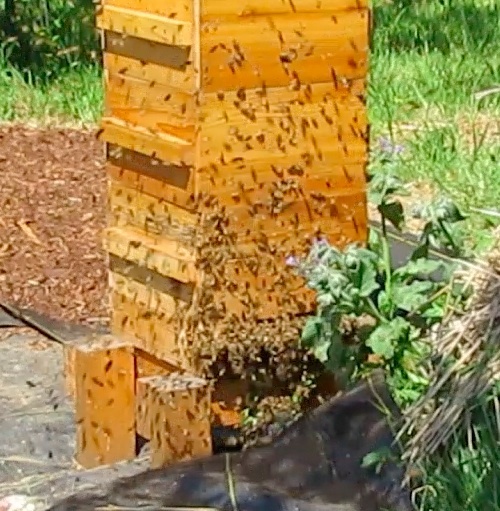 Best bet is to locate your queen – and split the hive in two (an artificial swarm of sorts). It seems like a labour intensive way of trying to stop swarming! 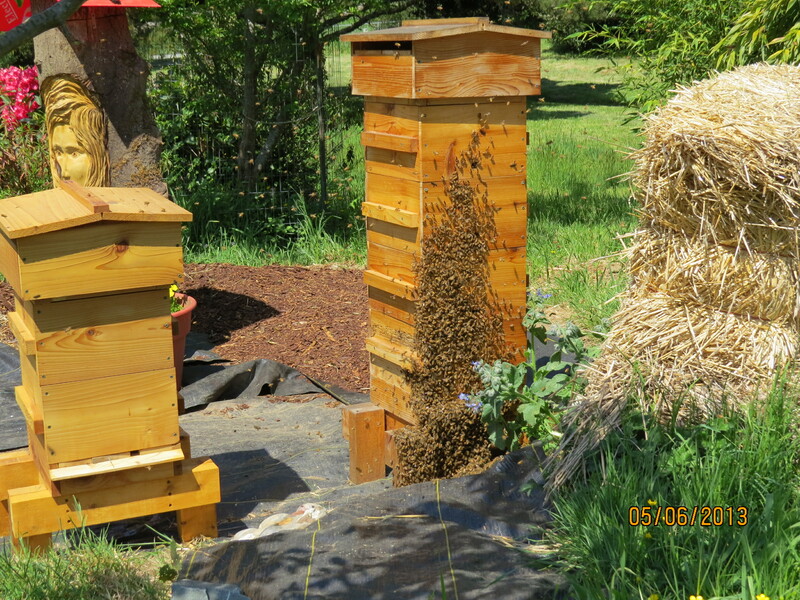 I agree with Leeann – I’d usually have a look inside and split the hive, putting one or two queen cells and plenty of nurse bees in a new box and leaving the old queen and no q.cells in the old location. This recreates swarm conditions without the bother of having to catch the swarm. 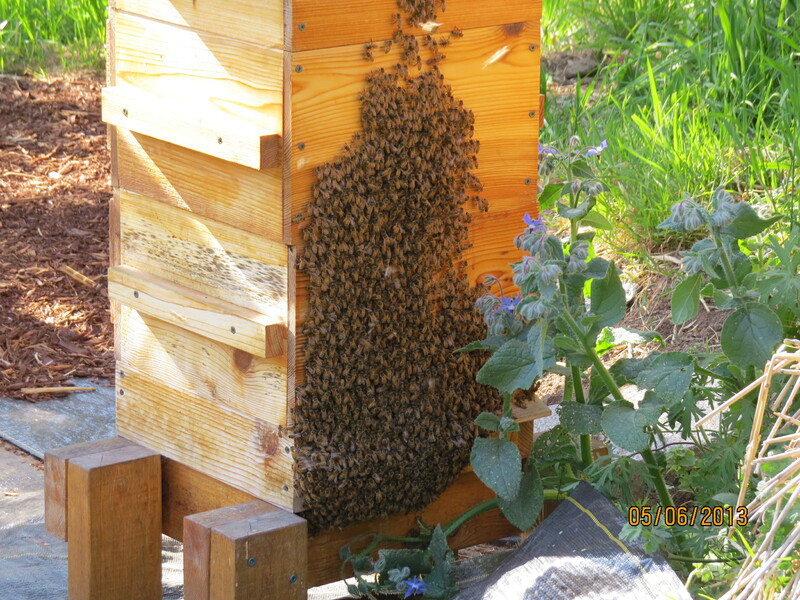 I’ve thought about splitting the hive…listened to the encouragements and explanations at the bee club. I have a cognitive dissonance about it. I like the idea of hive mentality. 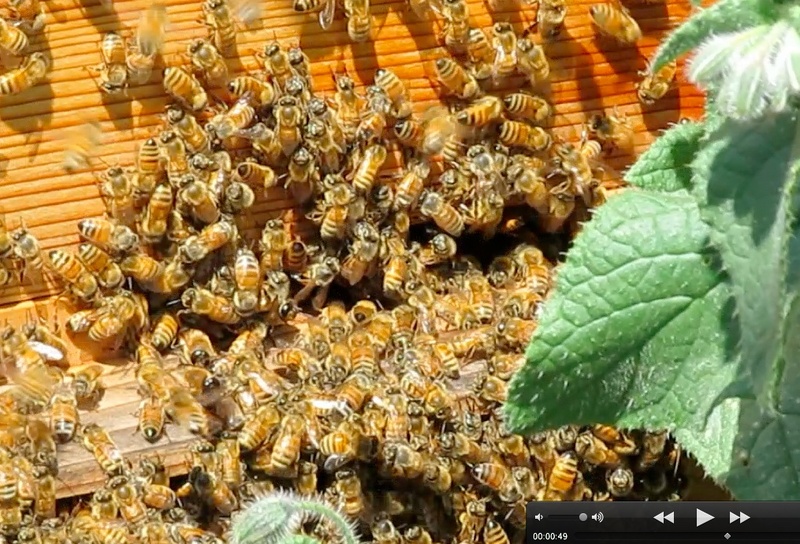 Let the bees pick out their own queen by building the queen cells and feeding them appropriately. I don’t feel qualified to pick and choose which ones should be allowed to live. Also I don’t want any more hives. I only wanted four hives max. I have five already. 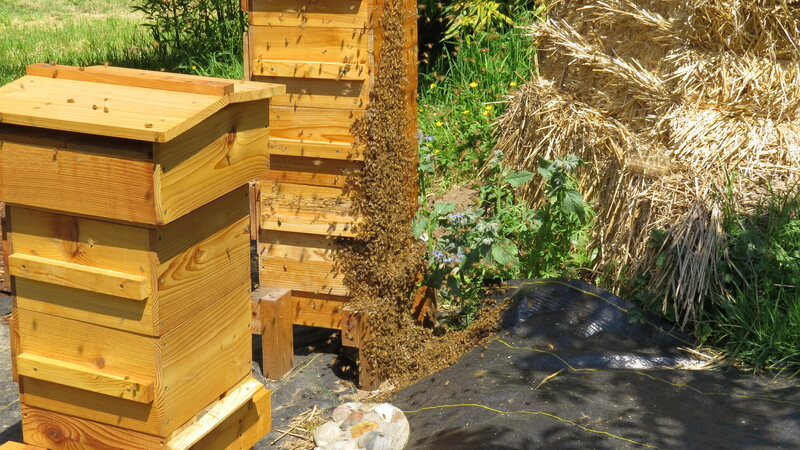 I don’t mind letting my swarm go out into the wooded area. So what am I doing by tanging them to stay close? Good question. Today I decided not to tang at all. They did their wild excited flying again. Loud buzzing included. I’m not sure how much louder it should get to qualify for a real swarm, but I could hear it halfway out to the garden. Twenty minutes later, everything is calm again. 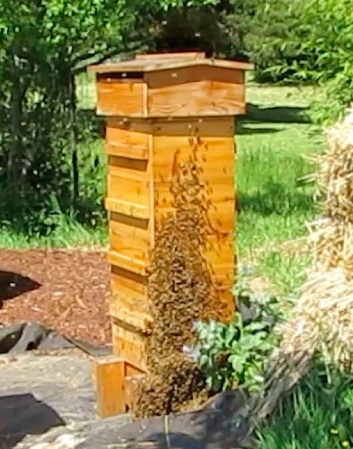 The bees that didn’t go into the hive just hung out on the face of it. 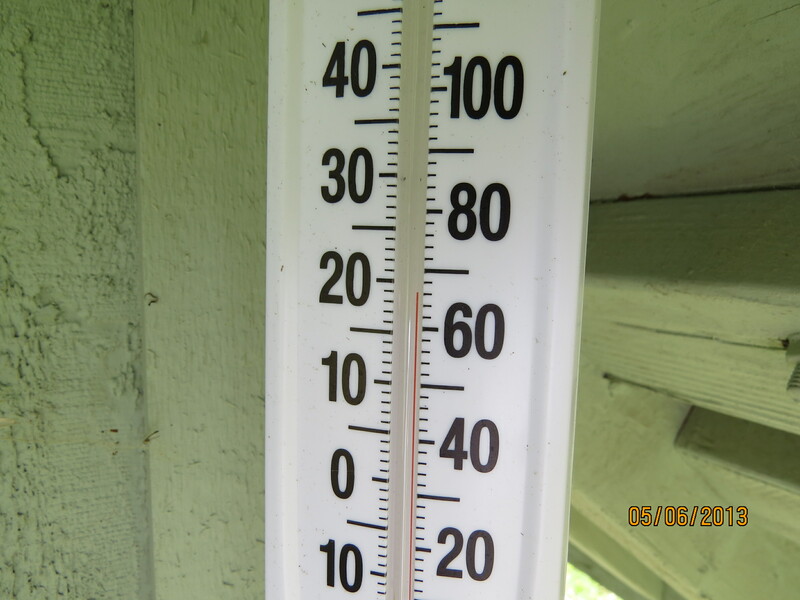 Maybe they ARE too hot inside. It’s the largest hive now. Interesting, sounds like they’re up to something! Perhaps they’re having fun teasing you. They’ve been successful at that. We were both standing out there today saying, “This is the day, for sure” only to find them going back in.